Born on July 26th, 2003 in Alanya (Turkey), Deniz Öncü rode a motorcycle for the first time aged four years old, when his father purchased his first minimoto machine. In 2011 he debuted in the Turkish Motocross Championship, winning his very first race and placing runner-up at the end of the season. From 2012, Deniz gained experience in different Turkish competitions and also entered the East European Supermoto Championship, where he managed to finish runner-up. In 2013 he began his relationship with KTM, and over two seasons he managed to claim two runner-up spots in the European Supermoto Championship, two in the Turkish Supermoto Championship, and another in the Turkish Motocross Championship (2013). In 2014, Deniz also participated in the Turkish Roadracing KNN 54 series. Deniz became double champion in the European and Turkish Supermoto championships in 2015, placing second again in the Turkish Motocross Championship. That season he continued his on-track progress, concluding the Turkish Roadracing season as runner-up, and did the same the following year. In 2016 he debuted in the Asia Talent Cup, where he finished in the Top 10 overall. His best result was a podium in Sepang, where he finished third in Race 2. In 2017 he took a big step towards his dream of competing in MotoGP, entering the Red Bull MotoGP Rookies Cup. In his debut season he finished fourth in the overall standings, fulfilling his goal of the Top 5 and also claiming two wins throughout the season. The first came at the third round in Sachsenring (Germany), the second at Brno (Czech Republic). That same year, the young Turkish talent became Asia Talent Cup champion, taking two wins (both at the Thai GP) and five podiums, earning a total of 156 points. In his second season in the Red Bull Rookies MotoGP Cup, Deniz Öncü would be proclaimed runner-up with a total of three victories and three podiums. In addition, in his debut year in the FIM CEV Moto3 Junior World Championship, the Turkish rider finished the season in fourteenth place overall. 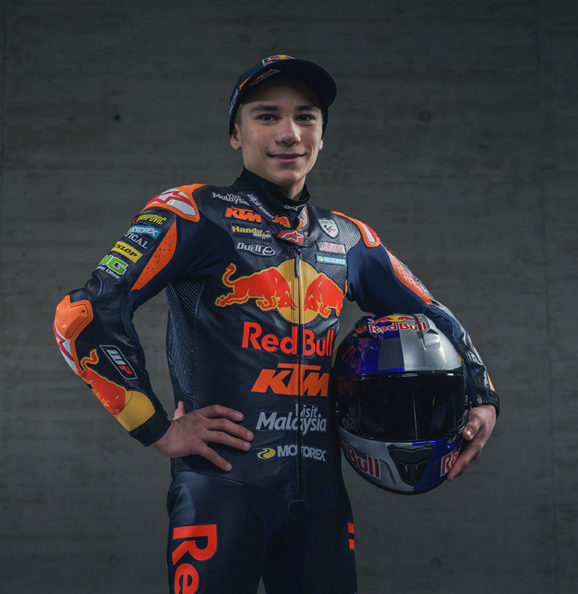 For the second consecutive year, Red Bull KTM Ajo and Deniz Öncü will join forces in the FIM CEV Moto3 Junior World Championship. The Turkish rider will attempt a strong showing in the series, and prepare for select wildcard Grand Prix appearances when he turns 16 on July 26th.